In 1949, South Africa begins implementing apartheid. Read No Turning Back: A Novel of South Africa and Journey to Jo’Burg both by Beverley Naiddo. The Civil Rights Act passed after an eighty-three-day filibuster in the U.S. Senate on this day in 1964. Read A Tugging String by David Greenberg, Child of the Civil Rights Movement by Paula Young Shelton, illustrated by Raul Colón, and The Civil Rights Act of 1964 by Robert H. Mayer. Antoine de Saint-Exupery was born in Lyon, France, on June 29, 1900. Called the Sun King by his family because of his golden hair, the young boy truly had his eyes on the sky. At the age of twelve he made his first flying machine from a bicycle. In The Pilot and the Little Prince, Hans Christian Anderson Award–winner Peter Sís presents this boy’s quest to fly. Antoine failed at various other professions, including architecture, but convinced his mother to pay for airplane-flying lessons. He served as a pilot in the French military and ultimately worked for a French airline that delivered mail. In small panels and segments, alternating with breathtaking double-page spreads, Peter Sís brings alive the details of St. Exupery’s life. 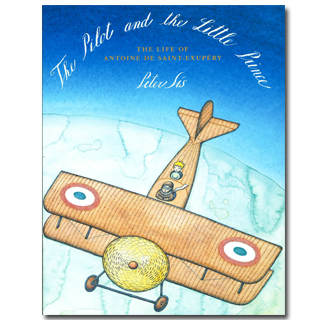 As Antoine transitions from celebrated pilot to writer, dozens of details about his life emerge in the book’s pictures and text. Fleeing France under German occupation in World War II, St. Exupery came to live in New York, where he wrote and published his first book in English—the book that made him immortal—The Little Prince. Then, on July 31, 1944, St. Exupery made his last flight in North Africa, never to return. In his final spread, Peter Sís shows St. Exupery’s plane ascending to the stars, encasing the boy on a bicycle. Peter Sís was given a MacArthur Fellowship for his genius as a book creator, and this book shows all the hallmarks of a master at his craft. Exquisite design, powerful use of a color palette, superior draftsmanship—all the elements readers have grown to love in Sís’s work—are used with great precision. Sís covers events and facts both major and small: St. Exupery’s dog, Hannibal, was his constant companion in New York. 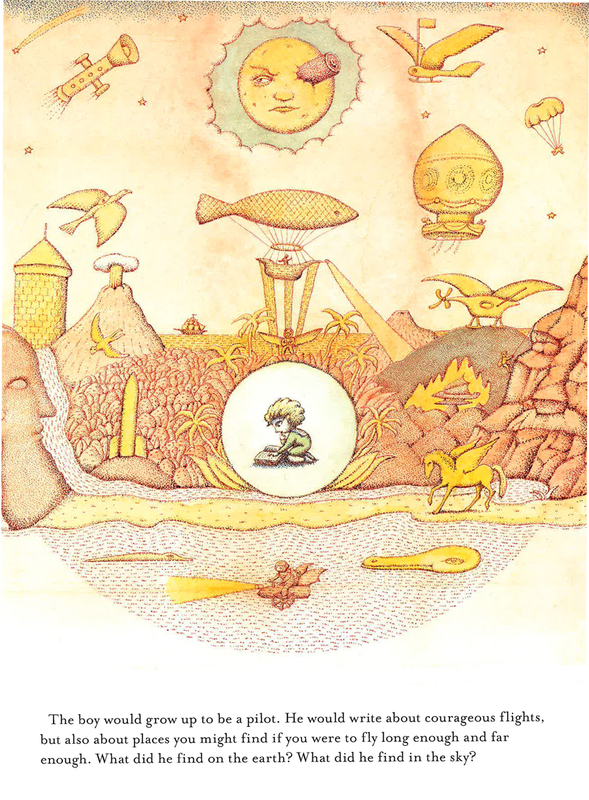 And the double-page spreads, such as the one featuring the landscape from a pilot’s-eye view, show what Peter Sís can accomplish as an artist. Only one thing saddens me about this completely satisfying book. The book is dedicated to “The stars—dreams—Frances Foster.” One of the most beloved editors in the children’s book field, Frances was also one of the most gifted editors of her time. Peter was able to show his editor the finished book. He got to see her eyes light up as she pointed to pictures, going over a book they had worked on together. This month, Frances passed away, and is now—like St. Exupery—headed to the stars. But it gives me, and those who also adored her, comfort to know that this book and other titles that she worked on, like Louis Sachar’s Holes, still stay with us on earth. And every time a reader picks up The Pilot and the Little Prince, both Peter and Frances will be there with them. Originally posted June 29, 2014. Updated for . The picture is interesting. And engrossing. You are about to exit the screen because you are done with viewing the picture when something in it catches your eye. What a beautiful tribute to this book and to Peter and Frances. Thanks, Anita. How could I have possibly missed this book! It’s a wonderful story and new to me. I am long a devote to the writing of Antoine de Saint-Exupery. As a pilot, my favorite book was Wind, Sand and Stars by St. Exupery. However, the real treasure here today is Anita’s essay about the protagonist, the author and illustrator. I’m out to buy it!